Yesterday I enjoyed an easy ride up to the summit of Mont Ventoux from Bedoin. I have ridden Mont Ventoux twice before from the Sault side (super fun), and descended once down into Bedoin. But this time I came to Provence to ride this mountain from what is thought of as the more difficult side, from Bedoin. A month riding in France has afforded me an easy ride up Mont Ventoux. I was warned about the wind, and the heat and the cars by some riders in the Pyrenees and by my brother. I heeded their advice and took off early. There was a steady stream of cyclists out of Bedoin with the same idea to beat the heat. Most of us were going the same pace, passing the slower riders, keeping it very steady through the shaded trees in the morning. I paced two other cyclists most of the way up the lower section. Just before the cafe, one of them finally passed me. He came along side of me and began a lengthy paragraph, explaining that he would lead for a while. I looked at him wide eyed, somehow understanding everything he just said but not speaking a word of Dutch myself. I happily tagged along in between the two riders from Belgium (because by now I have learned, in France, Belgians are my friends). I watched as the swarm of small flys moved from me to him. All the while thinking, THIS is why the GC contenders in the Tour de France ride with a pace-man in front of them - the flys tag onto the first guy. All this time I never realized Jens Voigt is simply one big fly magnet. (These weren't the biting kind, just annoying around my face kind). All I had needed these past weeks in the Pyrenees was a pacer! We rode steady and didn't stop until the top. The heat touched us on the last L shaped bend (near the Tom Simpson memorial) before the summit. As one of the Belgian guys said, "once we were out of the trees, it was very nice". The views at the top were spectacular. It wasn't a hard ride today. I think the conditions on Ventoux is what makes it a tough ride. It can be very cold, very windy, very hot, very crowded. I had none of this, there was no suffering today. I am probably in good shape by now, and perhaps rested from my trip to Spain, but leaving early was of key importance. The crowds were headed up as I was headed down the great descent! I stopped for a morning coffee at Chalet Reynard and was back in the town of Bedoin to watch the Tour de France go over the Peyresourde, Aspin, and Tourmalet, enjoying a chevre salad lunch at a cafe (after changing out of my cycling clothes, of course!). I still really like Mount Ventoux. I definitely have an attachment to this mountain. Mont Ventoux appears to be snow capped from a distance, but it is not. It's distinct look is actually exposed limestone rock at the summit. In the 1200's they began to cut down the trees that once covered this mountain for shipbuilding and firewood. Following the deforestation, centuries of heavy human and animal traffic depleted the soil which was blown away in raging winds. The wind can blow up to 200mph on top of Ventoux. Wind speeds average 55mph for almost two-thirds of the year. After some serious floods in the mid 1800's they began to reforest the lower slopes of the mountains. Wild boar, deer, hares, and snakes now live in the dense forest at the base which provides shade for cyclists and cycling fans. 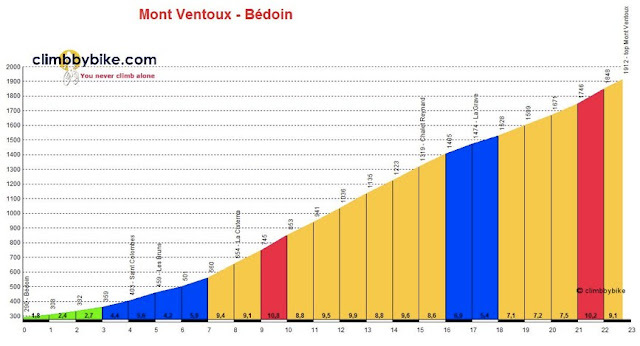 Mont Ventoux is sometimes a defining stage in the Daphine Libere or the Tour de France. Mont Ventoux has a great cycling scene on the road and at the top. You will hear languages and see kits from many different countries. Everyone shares the joy of accomplishing the climb. Even the persons in the support-cars cheer you on, which I have to admit is really fun. The Tourmalet is like this too, and so is the Galibier. It truly is a feat (and a fete - that means festival in French) to climb these mountains on a bike. There is also a fun bike shop in the town of Bedoin at the base of the climb up Mont Ventoux. The cycling shop sells Ventoux bike jerseys and Pro team kits, and Tour de France trinkets. You can watch the men play bocce ball in the court in the center of town, and have a beer in one of the bars. Plenty of parking in the town lot. After a month of riding a bike in France I can definitely say, you do not want to miss Mont Ventoux, the Horquettes d'Anicizan(up)/ Col d'Aspin (down) loop, and the Col du Soulor/Col d'Aubisque combo. They are spectacular on a bike. Also the Tourmalet, on either side, everyone seems to have their opinion about which side is harder. I should say however, I like climbing, and I am better when it gets to be 9-10%, I also love big road descents. These past weeks have taught me that I am a road cyclist, not a touring cyclist (although I am a beach cruiser in flip flops cyclist). I like safe clean roads with happy cyclists. And I like to be around other people who are having a great time riding their bikes. With that said, I head for the Tour de France. As I have heard so many times in the past month, enroute up these big climbs, "courage!". I am happy to be returning to the farm south of Pau.